This piece by Peter Yeo, United Nations Foundation Vice President for Public Policy and Advocacy, was originally published on the United Nations Foundation blog on November 13, 2015. Malaria is a devastating disease—especially for children but also for their mothers and fathers. This week, I witnessed expectant mothers safely resting under bed nets provided to them by our UN partners. These women have somehow made it to the Bentiu camp I visited today—a camp established by the UN to take care of people forced from their homes and livelihoods as a result of the civil war. The camp is sheltering more than 120,000 people from unconscionable violence today, but that is not the only risk they face. Thankfully, these nets will keep the mothers from getting malaria and allow them to devote full-time energy to their newborns. The deployment of these nets couldn’t come at a more important time. The rainy season is just finishing here, and malaria-carrying mosquitoes are everywhere. Camp health workers told me that malaria cases have dramatically risen over the past two months, but the nets are beginning to make a difference. Sometimes the families need to be convinced that bed nets should not be used for fishing or stored away as a prized possession. That’s why the UN doesn’t just hand out nets, but works with families to ensure they use nets correctly and that kids sleep under them every night. 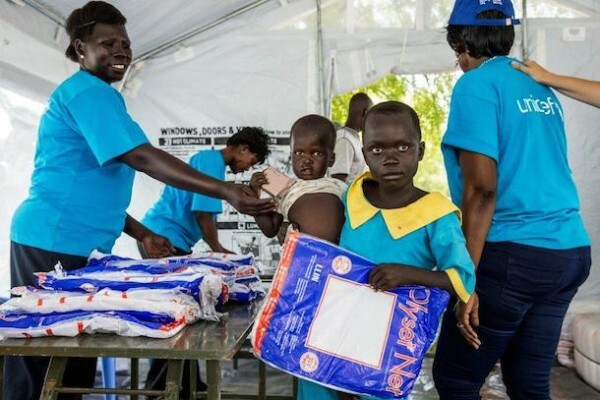 Supporting the malaria prevention work of UN agencies—particularly in aid of people who have lost their homes and livelihoods—has been at the core of the UN Foundation’s Nothing But Nets campaign since its inception. Our Nothing But Nets and United Nations supporters should be proud of the lives they have helped save through donations and advocacy. Let’s keep it up! Tell world leaders to step up the fight against AIDS, TB and Malaria by supporting the Global Fund!